Welcome Home Series handlesets are the perfect addition to your front door to create a unique and fashionable entryway to your home. Each is stylishly designed to provide maximum-security protection. There are many styles, finishes and configurations from which to choose. Phoenix's decorative accents will complement any home dicor to make a great first impression. This privacy knob/lever is best used in interior bed and bath applications where privacy is required. Both knobs/levers are locked or unlocked by turn button inside. The outside knob/lever can be unlocked by an emergency key. The crisp, clean appearance of the Satin Nickel finish adds to the overall look of the product and brings a modern feel. Collections by Weiser offers five handlesets to choose from. These handlesets offer solid forged brass construction and Grade 1 cylinders for uncompromised security. Exuding a sense of timeless beauty, the oval shape and sophisticated lines of the Brixton knob make a lasting impression. This half-dummy, or trim function, is surface mounted on doors where only a pull is required. The crisp, clean appearance of the Satin Nickel finish adds to the overall look of the product and brings a modern feel. The Elements Series<sup></sup> provides an expanded choice in Fashion Doorware at an affordable price. In decorating your home, choosing the right paint, wallpaper, tile and trim is important in creating a personal design. The Elements Series of Fashion Doorware will support and enhance your decorating decisions. Simple, elegant, and clean, the Fairfax knobs fits snug in the palm of your hand This privacy knob/lever is best used in interior bed and bath applications where privacy is required. Both knobs/levers are locked or unlocked by turn button inside. The outside knob/lever can be unlocked by an emergency key. The Satin Chrome finish gives the product a modern and minimalist look. 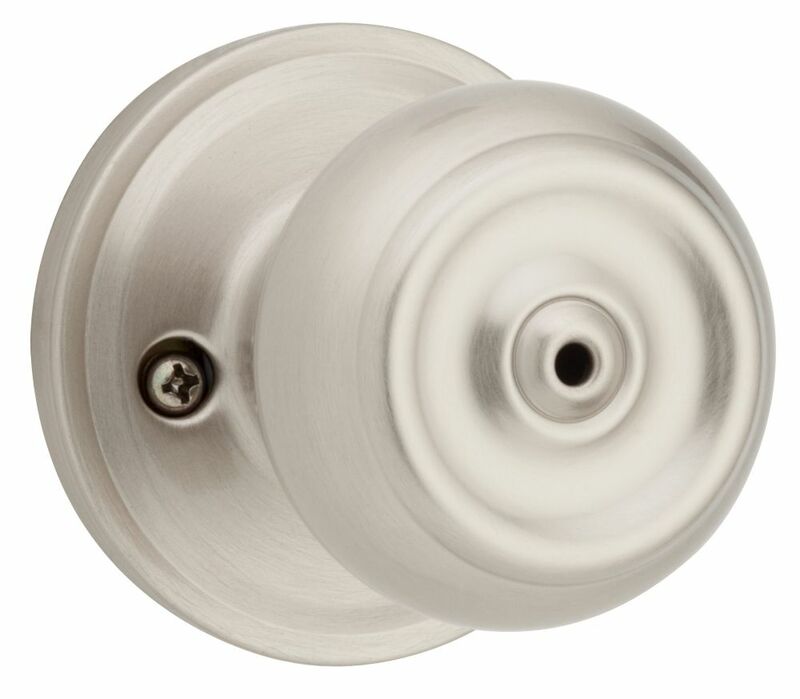 Phoenix Privacy Knob in Satin Nickel Welcome Home Series handlesets are the perfect addition to your front door to create a unique and fashionable entryway to your home. Each is stylishly designed to provide maximum-security protection. There are many styles, finishes and configurations from which to choose. Phoenix's decorative accents will complement any home dicor to make a great first impression. This privacy knob/lever is best used in interior bed and bath applications where privacy is required. Both knobs/levers are locked or unlocked by turn button inside. The outside knob/lever can be unlocked by an emergency key. The crisp, clean appearance of the Satin Nickel finish adds to the overall look of the product and brings a modern feel.